Like bread you will rise in the eschaton. 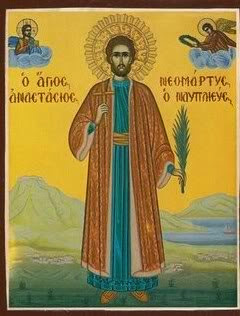 Anastasios, the holy neomartyr, was born and reared in Nafplion of the Peloponnese. He was a painter by trade. In his homeland, he was betrothed to the daughter of a a certain Christian. However, a few days later, he heard of some faults of his fiancee, and he dissolved the engagement. The parents of his former betrothed (not being firmly grounded in Christianity) took recourse in the magic arts to inveigle him into loving her and joining her in wedlock. Consequently, within a short period of time, the charm began to take effect and the young man went completely mad, roaming about aimlessly. The Hagarenes noticed this behavior and took advantage of his insanity, making him a Muslim by circumcision. Despite this, God pitied Anastasios, and, in a matter of days, He granted him complete restoration of his mental faculties. 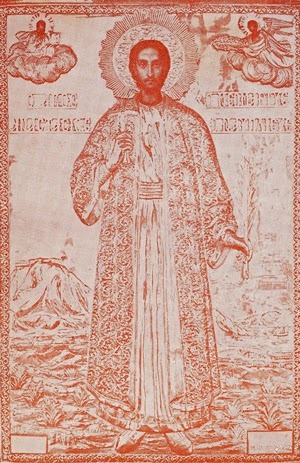 When Anastasios regained his senses and saw that he was wearing a white turban on his head like the Muslims, he shouted without hesitation into a crowd of Turks: "I was a Christian, I am a Christian, and a Christian I will always be!" When the Hagarenes beheld that he rued the conversion, they ran to him and violently set upon him. 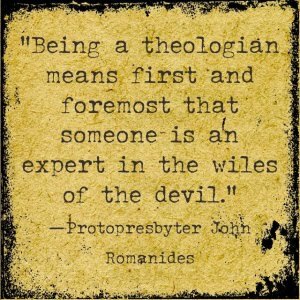 They beat and dragged him all the way to the judge, who endeavored, in diverse ways, either by fawning over him or employing threats, to draw him away from Christianity. Nevertheless, the Martyr did not give consideration to any of this. Refusing to concede, Anastasios firmly announced: "I am not denying my Lord Jesus Christ, the true God; for I believe in Him and worship Him as my Creator and Savior. Suffice it to say that I do not have the slightest need of your religion; moreover, I detest you and your prophet." At this point in the proceedings, the judge decreed the beheading of Anastasios. The infuriated Hagarenes did not concur with the judge's sentence. As soon as they removed Anastasios from the court, they violently attacked him (as did the Hebrews against the Protomartyr Stephen). Some Muslims came to Christ's Martyr with clubs, others with knives. They stabbed the Martyr's body until they rent him asunder into small pieces. Thus did the blessed Anastasios gain a martyr's crown in the year 1655. 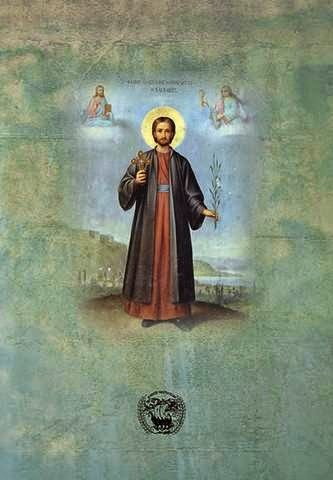 Saint Anastasios is now rejoicing with the choir of martyrs, to the glory of the Father, Son, and Holy Spirit. Amen. After the martyrdom of blessed Anastasios on February 1, 1655 (others say it was 1654), his memory was celebrated by the faithful in the Parish Church of the Nativity of the Theotokos, where there is an olive tree and monument associated with the martyrdom of Saint Anastasios. 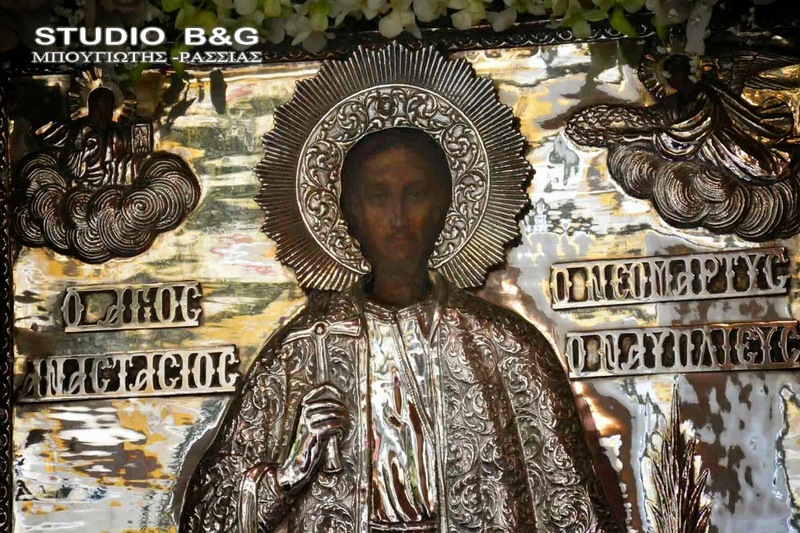 It was in this church of the Panagia, built during Venetian rule around 1700, that the bones of Saint Anastasios were brought after they were dug up and exuded a fragrant scent of holiness. 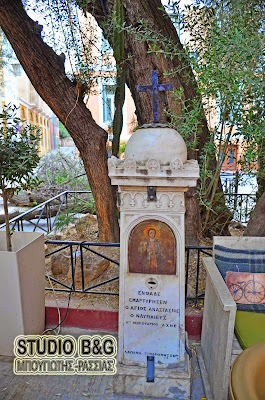 In the early part of the 20th century a cholera epidemic devastated Nafplio (otherwise spelled Nauplio), and all hope was lost. 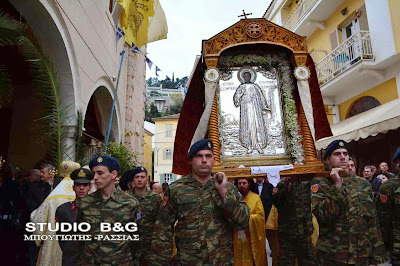 When it seemed as if the whole city would perish, a priest remembered the old relics of Saint Anastasios. 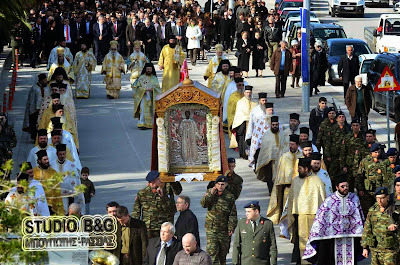 A procession was formed around the walls of the town led by the relics of Saint Anastasios, and following the procession the spread of the epidemic ceased. By Royal Decree, on 14 November 1935, February 1st was established as a day of complete rest from work in Nafplion so that everyone could celebrate the memory of Saint Anastasios. Services were written by Metropolitan Neilos Smyrniotopoulos of Karpathos and Kasou and Hymnographer Gerasimos Mikragiannanitis. 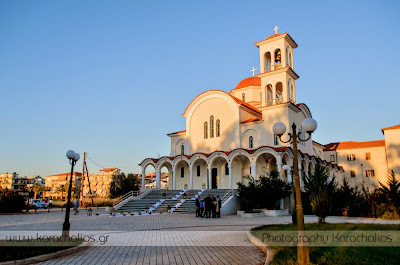 On 1 February 1990 His Eminence Metropolitan Iakovos of Argolidos, with the assistance of Local Authorities and the pious people, established a beauteous temple erected on the coastal road Nafplio - Nea Kios. On June 4, 1995 - which coincided that year with the Sunday of the 318 Holy Fathers of Nicaea of the First Ecumenical Synod - Metropolitan Iakovos of Argolidos, together with the Metropolitan of Monemvasia and Sparta and the Metropolitan of Artis, celebrated the inauguration of the temple. Since then there was introduced the annual festive celebration of the inauguration of the temple on June 4th in addition to the memory of the Martyr Saint Anastasios on February 1st. 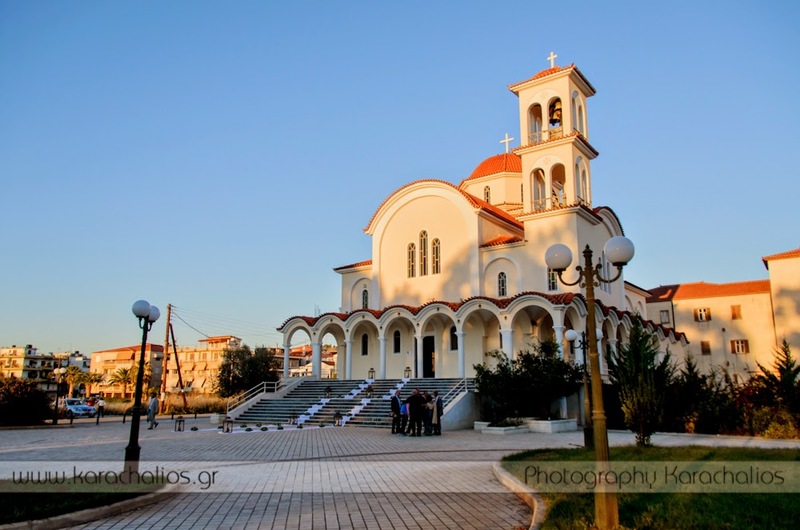 The Service for the Anniversary of the Inauguration of the Church of Saint Anastasios was created by Bishop Kallinikos Korompokis of Epidaurus.